"Lots Of Exercises On Improving Body Language, No Real Information on Attracting Women"
Very quick read. Exercises can be done at home and don't require any real equipment. Author is clearly an expert on the subject. No actual information about interacting with women. Writing quality is very poor. A bit too simplistic in regards to how this will attract women. This is a book solely about the importance of body language and how to improve it. Much more in-depth than other sources on this topic, with videos included to show you how to get the best body language possible. Attracting women is only indirectly talked about though, with claims that women will be attracted to you after you achieve more relaxed and natural body language. Not a complete system in its own right. Note: This review only pertains to the ebook, Code of the Natural. 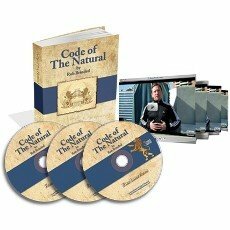 The author, Rob Brinded, also offers an advanced DVD home study course, which you can find here. This book is all about body language, and the importance it plays in being sexually attractive to women. Rob Brinded has a background in sports science and holistic healing and has worked with athletes from all over the world to get their bodies working as efficiently as possible. A side effect from his work was noticing how men with natural, relaxed body language were much better at attracting women. He tested out his theories on himself and claims he dramatically improved the way in which women looked at and responded to him. It's certainly no secret that body language plays a huge role in your ability to attract women. An oft-quoted study claims that as much as 55% of our communication is done through body language alone. Whether this is entirely accurate or not, it is clear that your body language says a lot about you. The Key To Attracting Women? A shortfall of this book is it implies that just by correcting a few body language issues women will magically become attracted to you. While incorporating better body language will certainly help you, it is only a part of the bigger picture. The reality of the situation is that even if women do find your presence more attractive, they will rarely initiate an interaction with you. It is still going to be up to you the majority of the time to approach a woman and lead things where you want it to go. The book makes no mention of this, and no actual information is provided on interacting with women. The sole focus is the what/why/how of body language, and attracting women seems to be viewed as an afterthought. In some cases there is some evolutionary psychology provided to back up the reasons for some facts and why they are important. In other instances, Brinded's personal hunches are given, and some might be debatable. What's really lacking here though are examples of successful interactions one might have after they get their body language in order. He mentions a lot of 'natural' friends he has who do well with women, so maybe describing their body language while talking to women or what they actually say would have helped here. It's too optimistic to think that carrying yourself more freely or having a more attractive walk is going to solve all of your dating issues. I think Brinded is banking on the fact that guys have already read or watched many other dating products and know how to approach and talk to women, which might not be the case. Brinded provides case studies showing that certain injuries or problems someone might be having with their body could be related to a different area entirely. For example, how a triathlete he treated had hamstring and calf injuries that were actually the result of muscle problems around his eye. It's really emphasized here how important it is to treat the body as a whole, and Brinded takes a holistic approach to what he does. There are links embedded throughout the book that lead to videos of various exercises being demonstrated. The main focus of his exercises seems to be freeing your body of stored tension and getting your body back to its natural, healthy state. Brinded also talks about how the mind and body are linked. So the process a lot of guys take when learning about dating, is they learn some knowledge, apply it, then see some success. Over time their beliefs become more positive and their body language adjusts naturally to reflect this newfound success. It stands to reason that by working on having the body language of someone who is successful and attractive to women, your beliefs might start to change to reflect this and you will feel more positive about yourself and women. Unfortunately, the way this book is presented is a bit of a mess. While Brinded is clearly an intelligent guy in the field of sports science, his writing skills are pretty poor. The structure is a bit all over the place, and the whole book looks as if it were put together in half an hour. The length of the book is 79 pages, but with huge, varying fonts used and cheap-looking photos, the actual content is much less than that. Ironically, the last part of the book is a page of dedications, with the last being to a woman for "checking my terrible grammar and spelling". I would hate to have seen it beforehand, as the finished version is downright awful. Be prepared for many, many mistakes here if you read this book. It doesn't make the information any less worthwhile, it just gives an overall feeling of complacency and looks amateurish. There are some interesting ideas presented here and most people would probably get some value from the exercises. As a complete system for attracting women though this falls well short. If you already have a base level of competence with women, you could apply the ideas here and probably see some success. If you have no experience interacting with women, this book alone will not help you. It may assist you when used in conjunction with other advice about how to approach and attract women verbally. Did you try out the exercises from the book. Did you feel better after doing them? Was your body moving more freely? Was your posture better? I was thinking of buying this but thought I should ask. Because if the answer is Yes to all of my questions, then this is worth buying. There are a lot of good materials on attraction and inner-game but none on body language. Many authors force others to change posture but that never helps. Plus I feel that if I can really move freely and have a good posture and have a relaxed body language, it will help my game a lot.